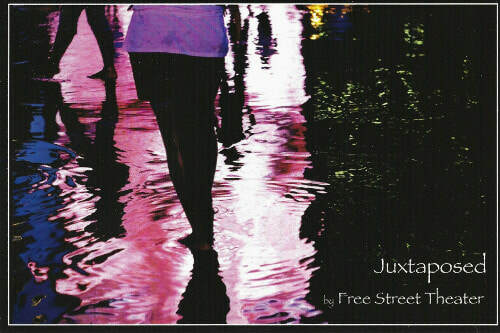 Created by the Little Village Free Street Ensemble. ​Dax is a boy who can’t seem to find himself in a place where everyone is perfectly satisfied with themselves. Amaya is a girl who can’t seem to figure out what she wants in a world where people want for nothing. 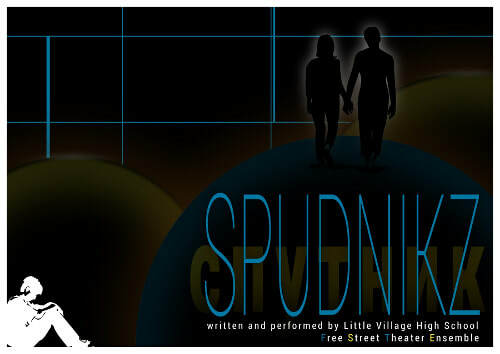 The two come together as traveling companions--Sputniks-- as they travel through strange lands looking for themselves. Rock-and-Roll version of Maslow's Heirarchy of Needs. 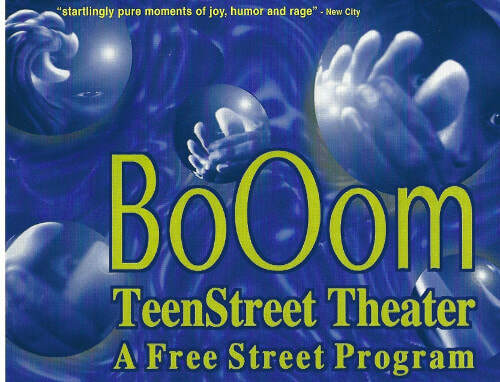 Scenes and music progress through Physiology, Safety, Love & Belonging, Esteem, to Self-Actualization. A hip hop and spoken word composition about breaking the myths on sexual violence in order to start the path to regaining self-worth. 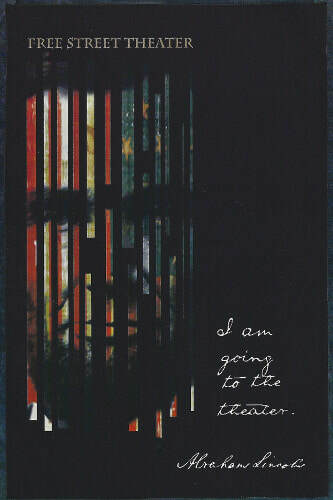 An ensemble production immersed in the last moments of Abraham Lincoln’s life depicting him going through five stages of grief in his final moments: shock, anger, bargaining, loneliness and acceptance. The ensemble explored Abraham Lincoln's struggle with depression, a life fraught with failure and a steadfast determination that led him to become president at a time when the country was unraveling. Research, creative writing, and character explorations led to the creation of a performance emerging from our collective imagination of the intimate thoughts of one miserable man who made one nation indivisible. 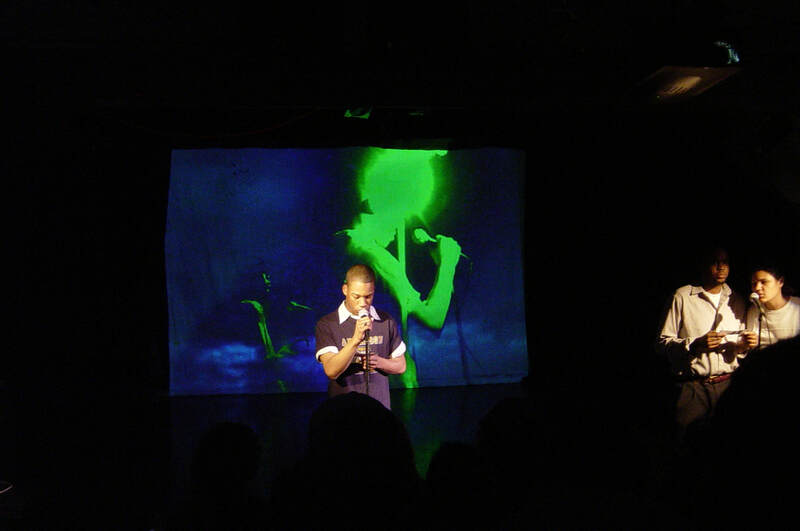 The performance takes place within a string based musical installation with accompanying vocals. 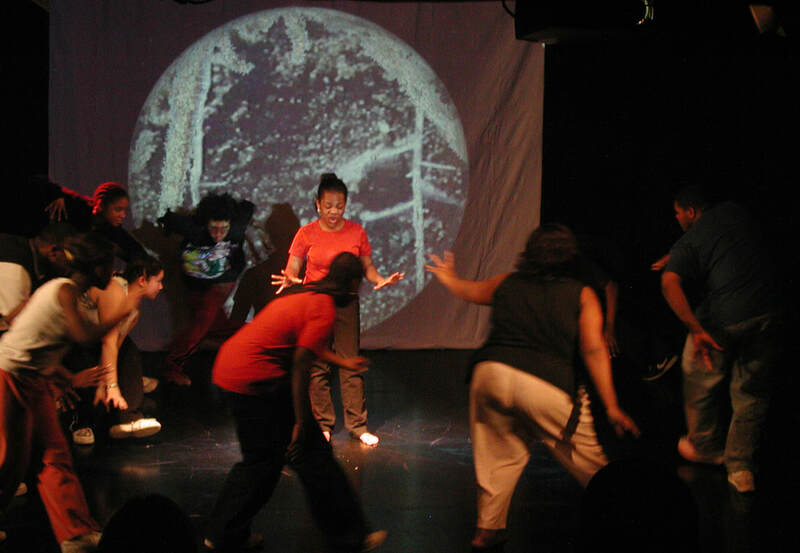 Sub-Prime Youth is an ensemble created performance developed as a creative reaction to the current economic crisis and rise in foreclosures. Sub-Prime Youth weaves the brutal realism of a Mexican-American family facing foreclosure with the emotional surreal music of the Muses of Destruction. 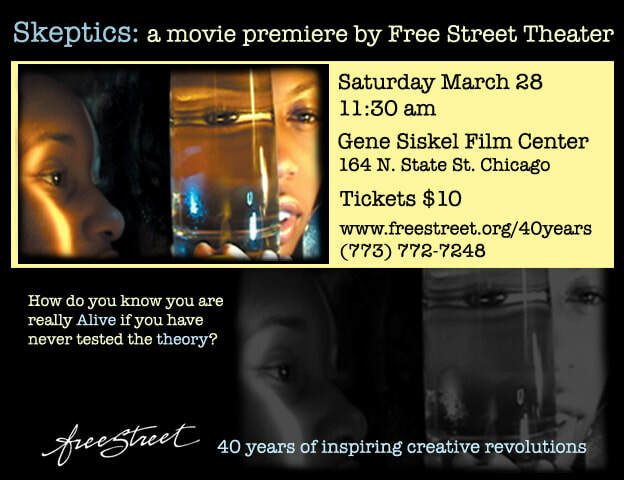 The premiere of Skeptics was shown at the Gene Siskel Film Center. Skeptics is Free Street’s first full-length feature film. 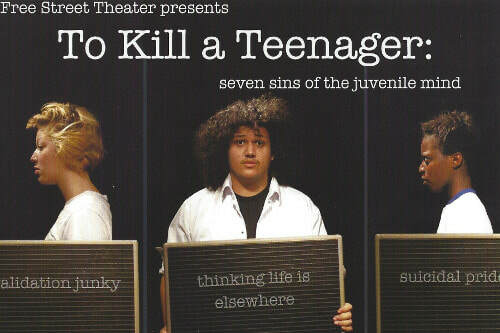 It was adapted from a stage play created and performed by the teen ensemble directed by Ron Bieganski, which was selected to tour in Germany, Austria, and the Netherlands. 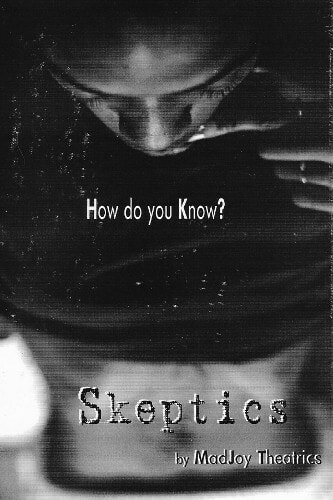 Skeptics was created in the off-kilter time that followed in the wake of the September 11th attacks. 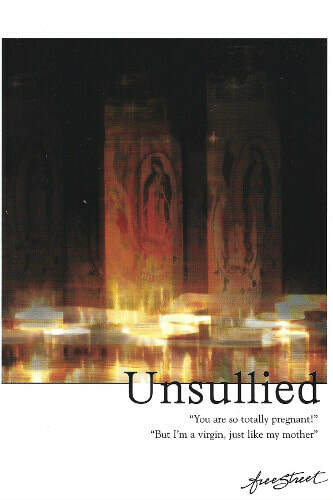 It tells the story of girl starving herself close to death in a quest to understand what it means to be alive. 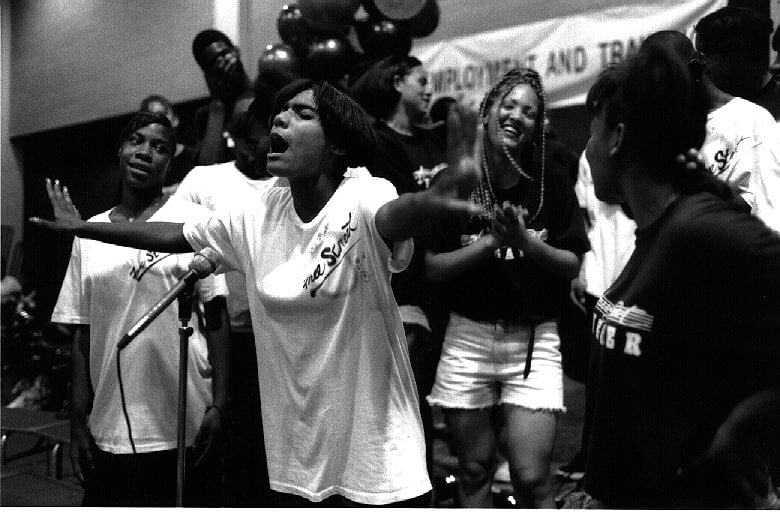 An ensemble play based on detailed explorations on the Civil Rights Movement, South Africa’s Truth and Reconciliation Commission, the Velvet Revolution in Czechoslovakia, with the play centering on the history of the U.S. education system and the academic disenfranchisement that students of color have faced dating as far back as slavery. 2008 - Director Ron Bieganski /Ast. 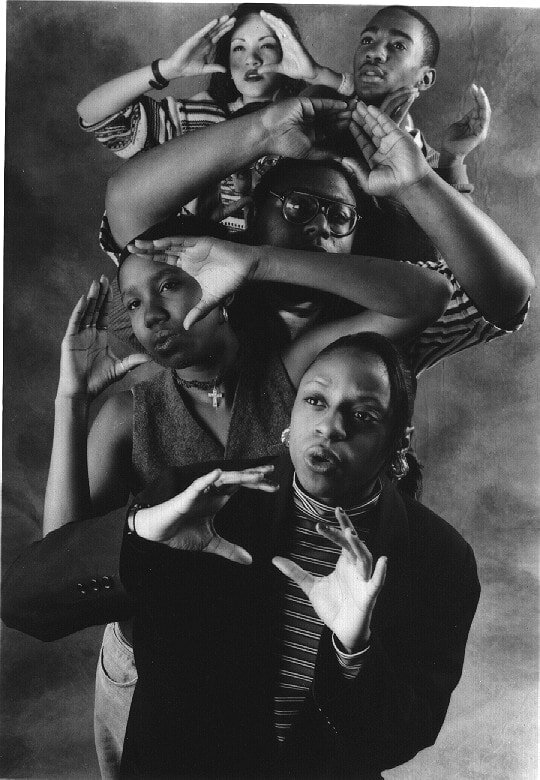 Directors Joy Conway, Anita Evans, Fannie Hungerford, Shanel Jackson. 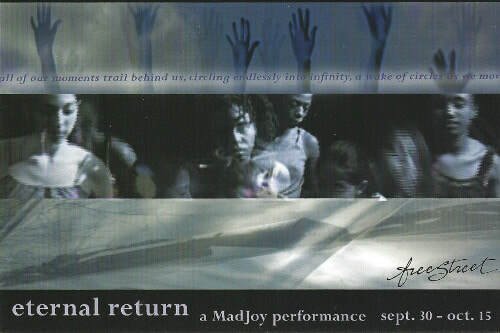 Ritual and Conceptual Performances happenings in public spaces. .
2009 - Directed by Luis Crespo, Bryn Magnus, Shawn Reddy with assistance by Jayita Bhattacharya, Daniel Jacewicz, and Mariusz Tarnozek. Association House of Chicago teen performance ensemble Voces Ansiosas/ Anxious Voices in collaboration with Free Street Theater explore a landscape that might be a poem, a game, or a dream. Who is the Evil Teddy Will? Will Victor ever get to play the saxophone? Is Sandy truly dead? Leonardo DaCaprio might be dreamy, but who promises to 'never let go' and then LETS GO? 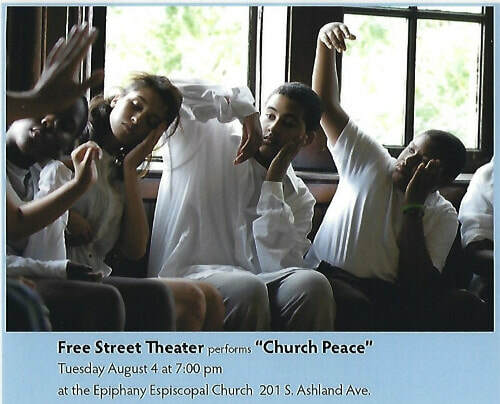 Two tribes fight for peace in an ensemble generated performance developed with teens at Hamilton Park. 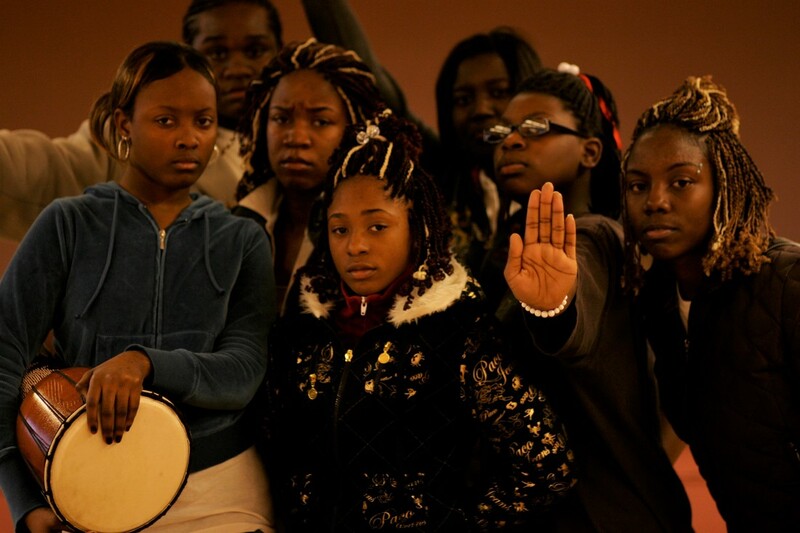 Two tribes fight for peace in an ensemble generated performance developed with teens at Hamilton Park. Mecca is aging in reverse. Her memory is backwards too. Mecca awakens as an 85 year-old woman with a full "memory" of what the life ahead of her will be as she gets younger. As soon as Mecca has lived an experience, she can no longer recall anything about it. She does not know who she has been, only who she is becoming. 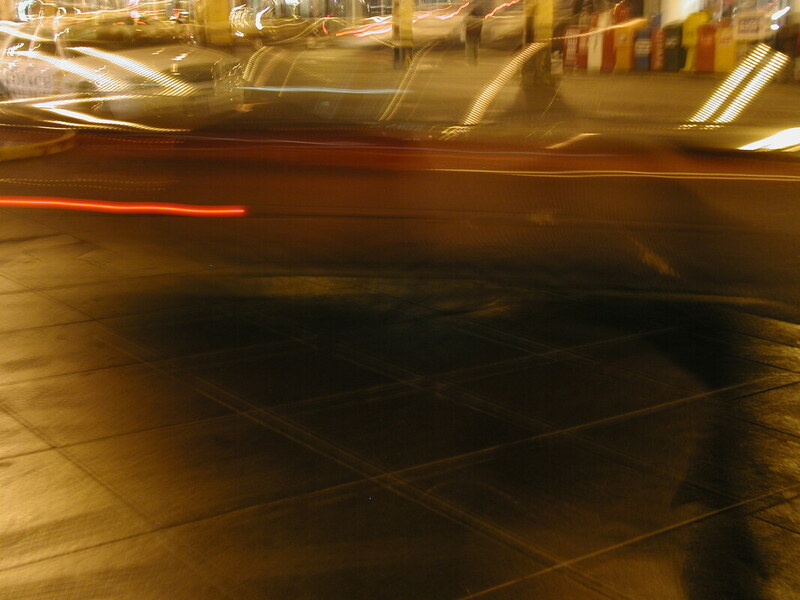 ​Unexpected happenings in public spaces. 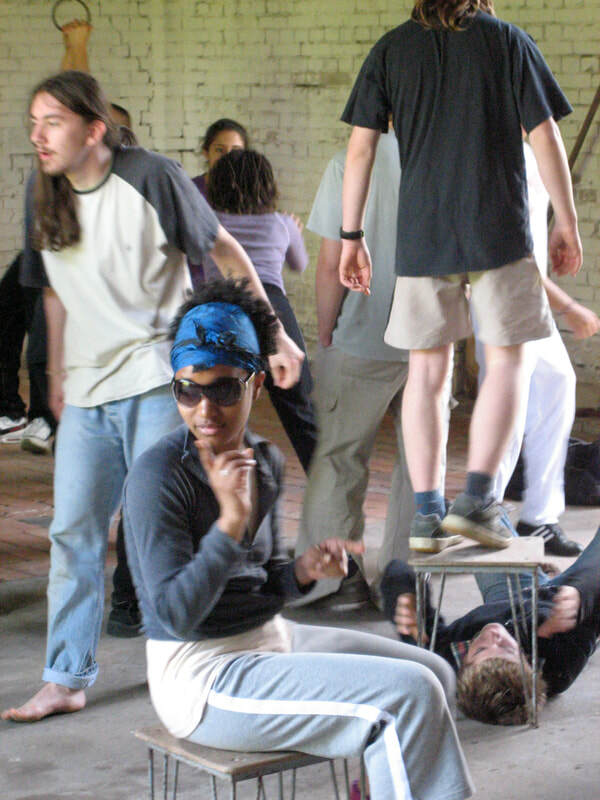 Director Jenny Magnus and the ensemble explore what it means to create unexpected performances. The ensemble is creating sequences they can take out in the world and make people think "what is going on?" They do Bus Stop Duets, Group Movement Phrases, Stranger Dialogues and CTA Cacophonies all designed to spark some curiosity. 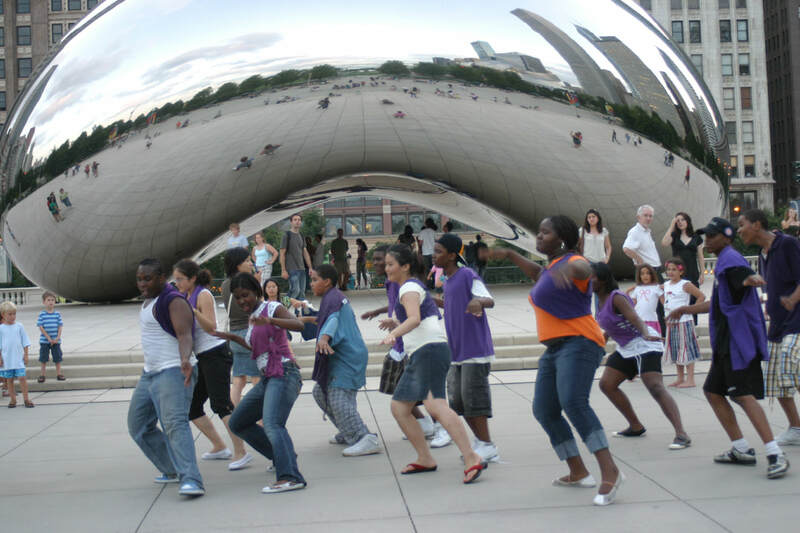 ​Free Shows and workshops for children in Chicago Park Daycamps. 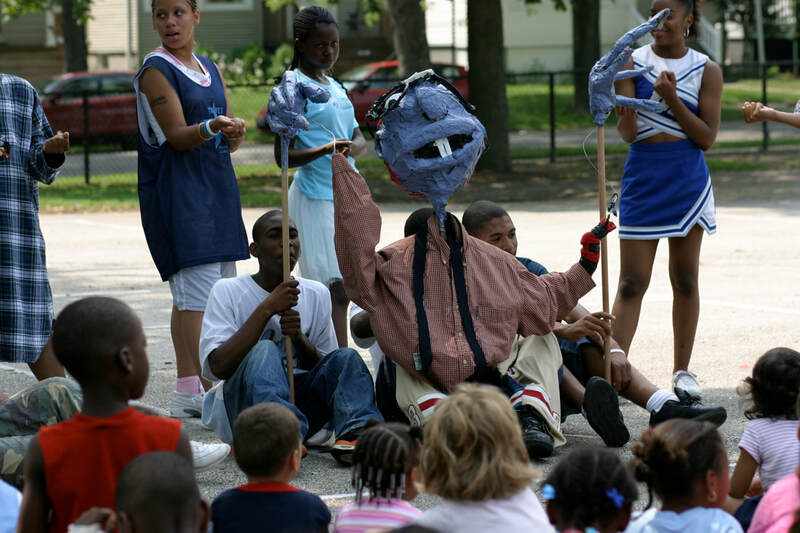 The story of Snow Beauty and Jack Diddle is touring all over Chicago and performing free shows for children in Chicago Park Daycamps. This is no ordinary sit-down-and-be-quiet-show. 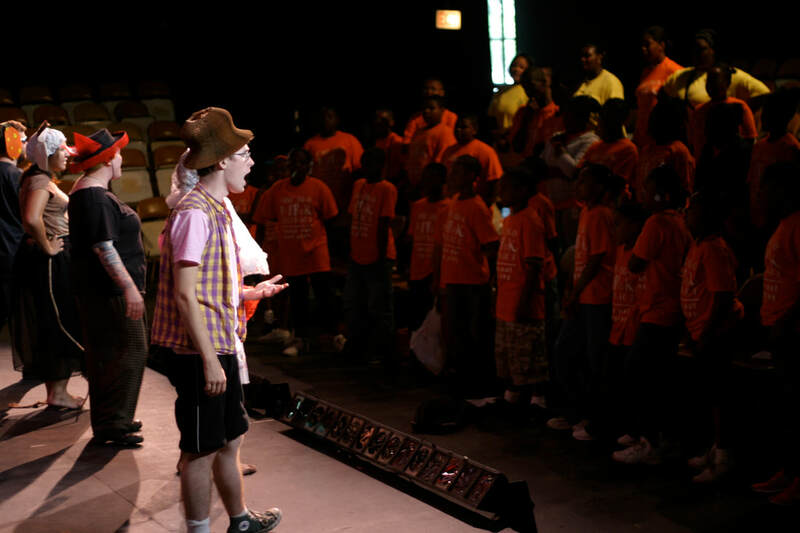 Children warm-up with the actors, and are depended upon to add their voices, mooing, oinking, meowing, and barking to help Snow Beauty and Jack Diddle figure out what to do with the magic-hat cat. 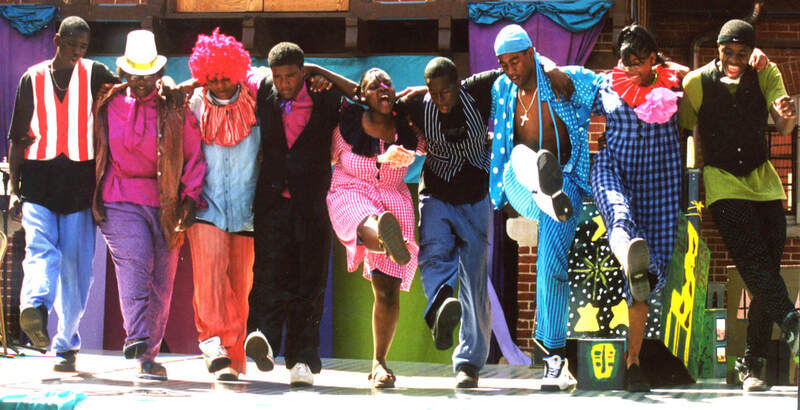 For older children, there is also theater workshop in which they participate in theater games with director Jeanine Vaughn and the cast..
Hip-Hop show for kids in Chicago Park daycamps. ​Students, Angels & Demons just trying to graduate High School. 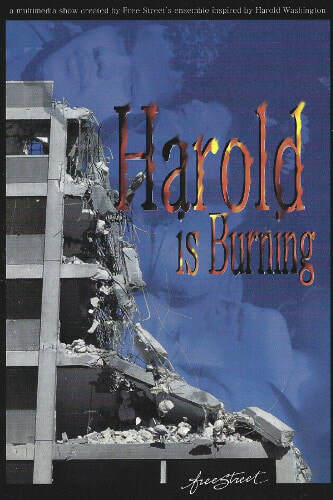 ​Inspired by studying former the Mayor of Chicago, Harold Washington and questioning issues of race, poverty, and education. 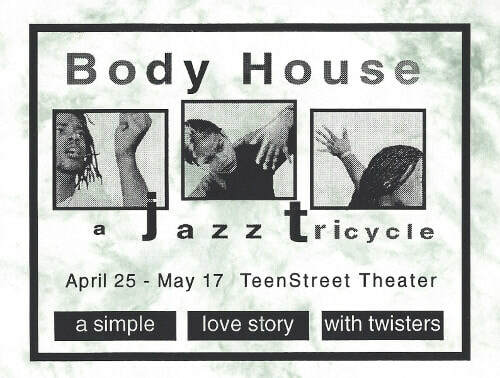 Performed at the Free Street Studio, DuSable Museum, South Shore Cultural Center, Theatre Building, and at the Chase Tower Auditorium as part of Looptopia. How do you know you are really Alive if you've never tested the theory? Every Choice Her Own. Young women poets mixing ideas and ink. 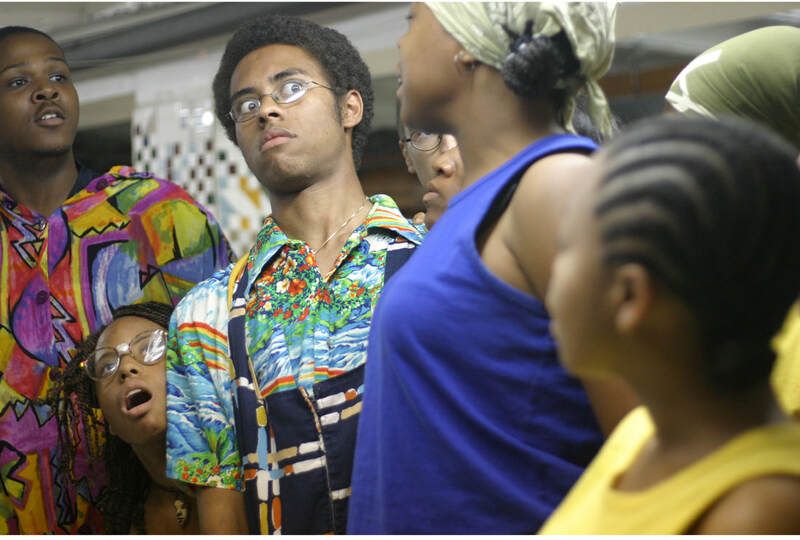 Created by teenagers in summer After School Matters ensembles.. 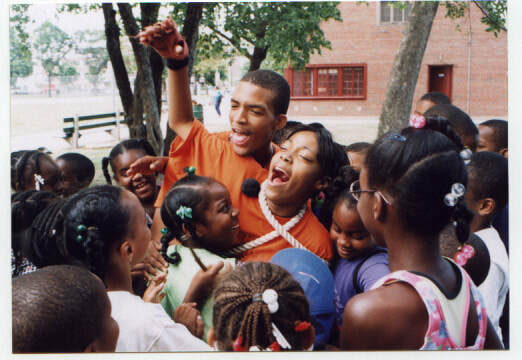 Performed for free to children in Chicago Park District daycamps all over the city. 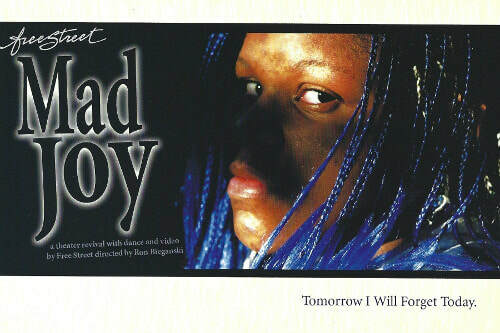 ​A bullied boy dreams of controlling his tormentors. A bunch of misfits work together to save the world. "But I'm a virgin....just like my mother." The haunted eulogies of Edgar Allen Poe, Henry Wadsworth, Tupac Shakur, and Notorious B.I.G as told by the women who served as their muses. 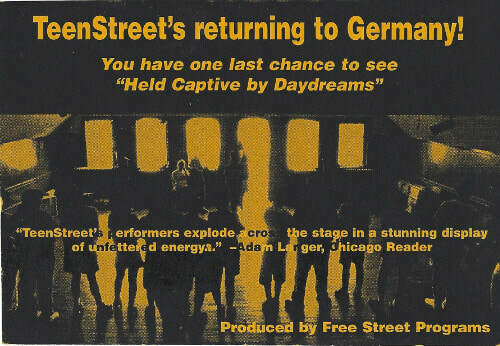 A theater cooperation between Metropolis Theater (Kreutzburg- Berlin Germany), Teatr Brahma (Goleniów Poland) and Free Street Theater (Chicago USA). 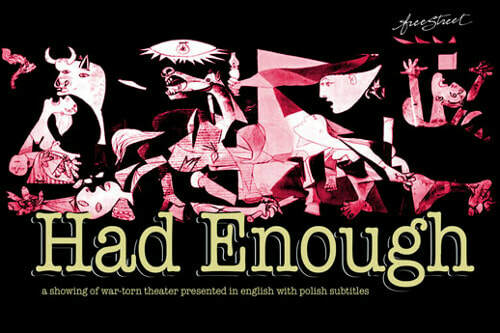 Adapted from Brecht, performed in Berlin, created in collaboration with German and Polish youth, performed in English, Polish, and German. 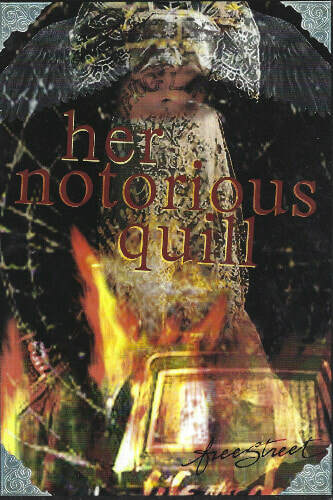 ​a group of girls who find themselves living in the eddies of time that ripple from the epicenter of a tragic event. 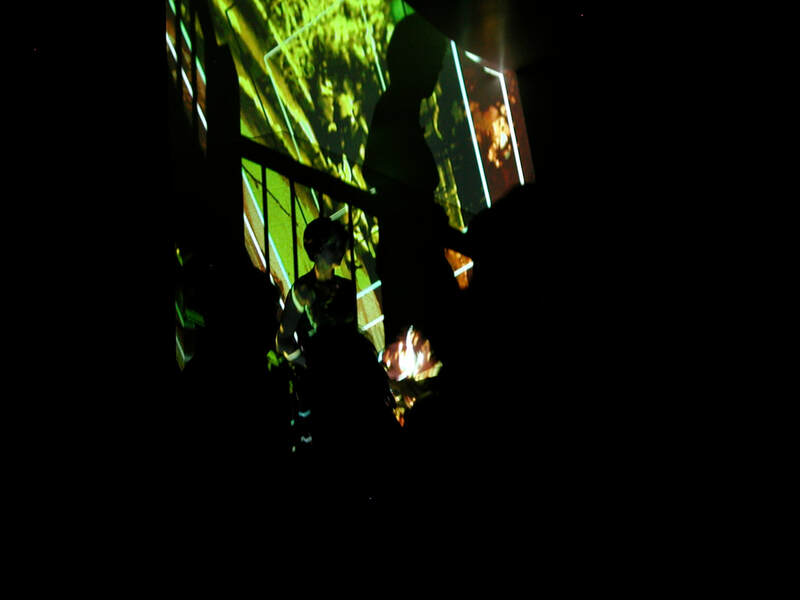 The show incorporates movement, bluesy country-death vocals, video images and a structure that ebbs and flows like memory. 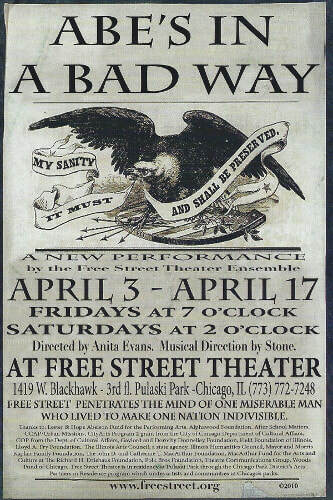 "The Sun-Times' top theater critic Hedy Weiss recommends, "If you are feeling at all cynical these days - you might want to pay a visit to Free Street." 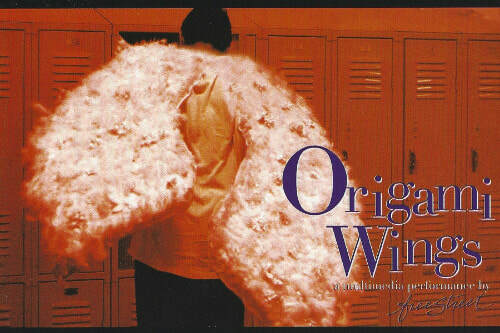 This ensemble has consistently produced provocative, creative, and original works for years. Oh... and they're high school kids, too." 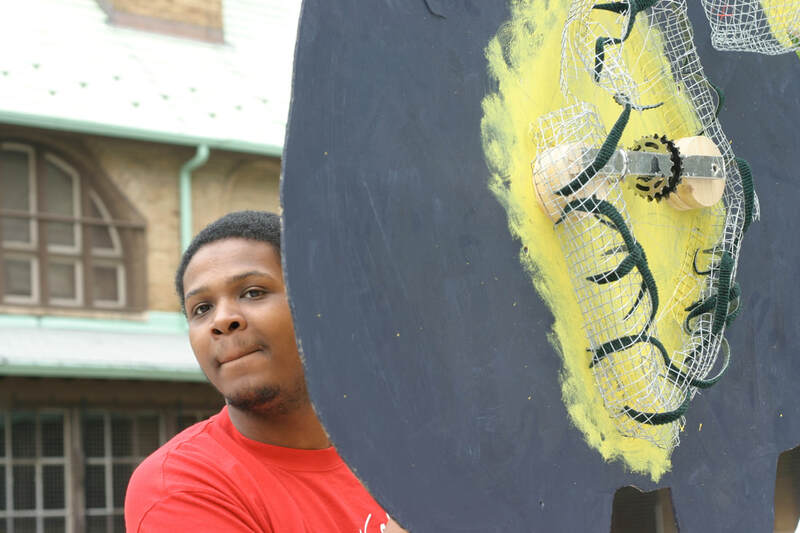 Columbia College Chicago and Free Street announce a dynamic environmental re-use theater project called Recyclone. 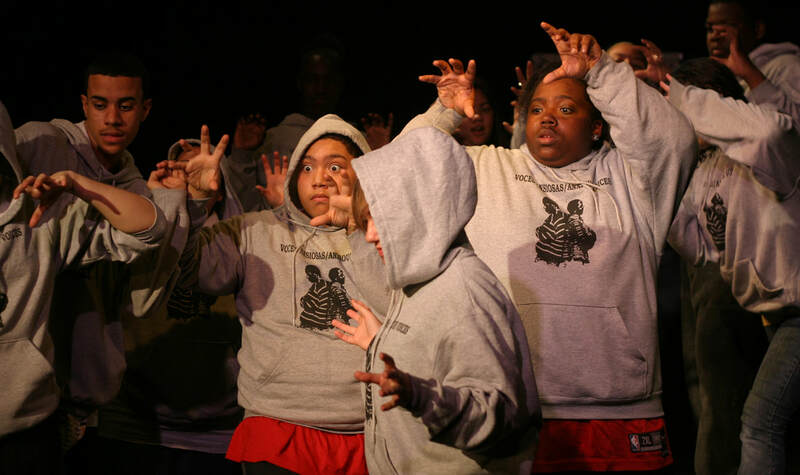 This college/community ensemble-created production began its life on the closing night of a mainstage Columbia show. The Recyclone crew took the set of that play and used those scenic bones to build an entirely new play exploring issues of regeneration, revitalization, reutilization and reorganization and kept a dumpster full of lumber out of the local landfill. 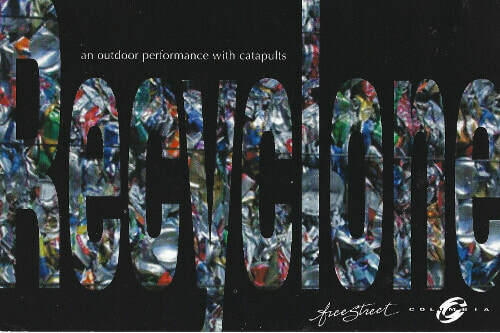 Recyclone is an outdoor performance spectacle with puppets, bikes, and catapults. 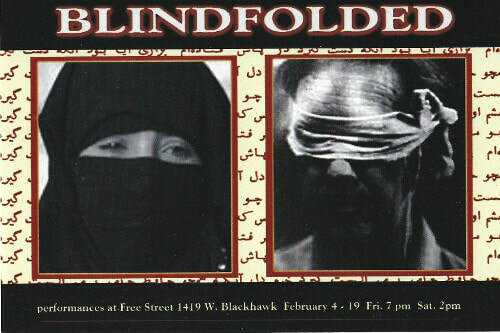 Blinfolded is an ensemble created multi-media show examining misperceptions between US and the Middle East in light of the 1979 Iranian Hostage Crisis and the attacks of 9/11. 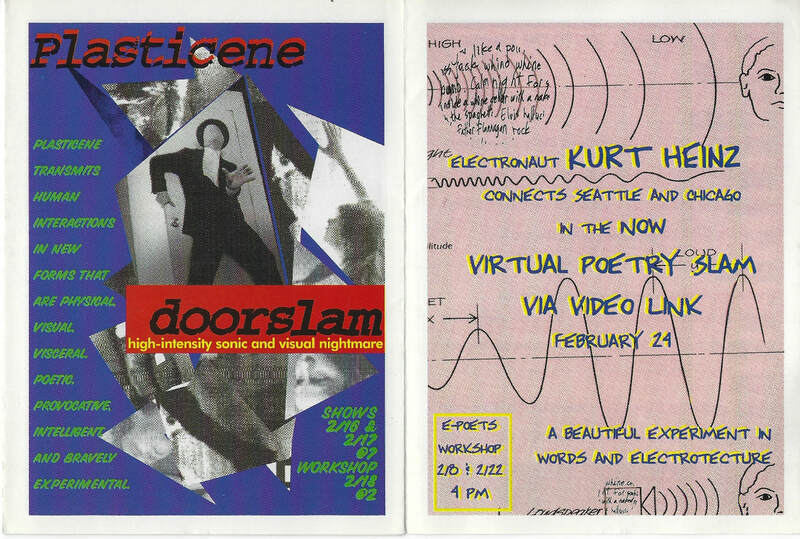 These events were explored by an ensemble of emerging artists who weren't alive for the first event but have vivid memories of the second. 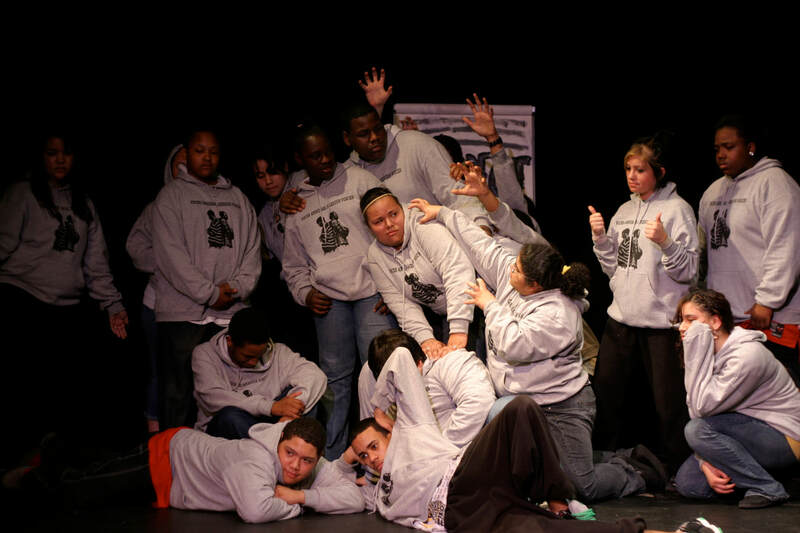 Free Street was invited to the Capital Forum to perform Blindfolded on March 10, . 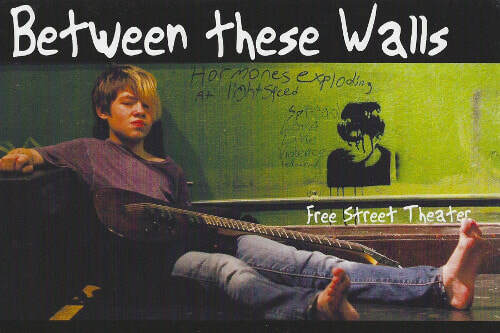 Free Street received the Lawrence W. Towner Award, an honor presented annually to an Illinois Humanities Council project which has demonstrated venture and risk-taking in the development and fulfillment of a public humanities project. 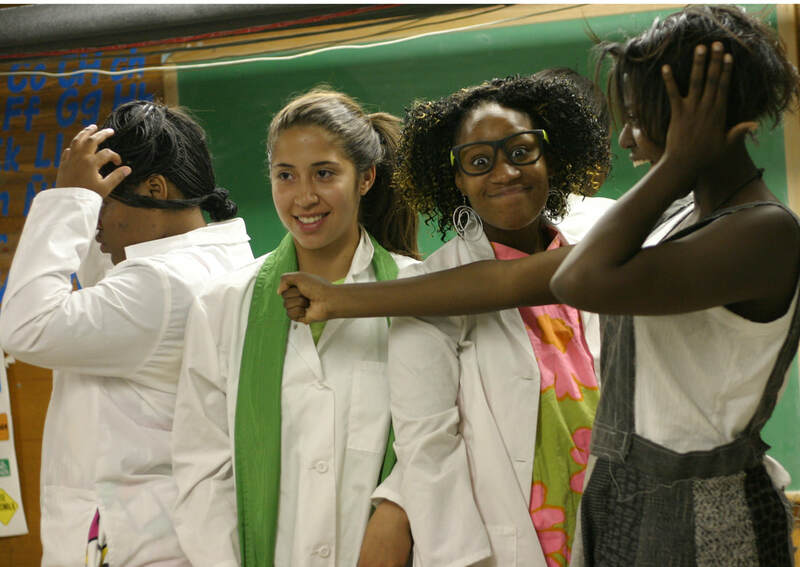 Blindfolded was performed at Oakton Community College in DesPlains on May 10 for a special presentation arrangened by cast member and honor society member Usra Ghazi. 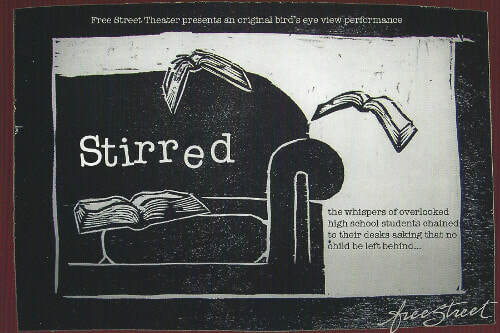 A Free Street / Hermit Arts collaboration written and directed by NEA.TCG playwright in residence Idris Goodwin. ​Welcome to Pluto / Midwest / where time is unreal/ Where music moves things along/ like factory steel / Where people speak poetry / and sing lyrics / all days / From natives on soil to concrete industrial haze / Ten moments / show the batttles and slivers of silence / The love, the villians, the leaders, the violence / The shifts in population, raace, gender and faces / This opera about connections between people and places. 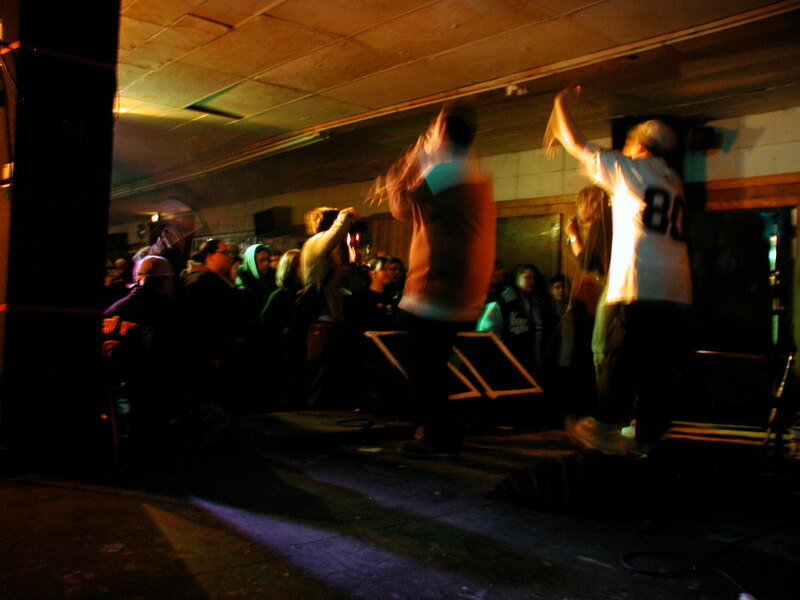 Also performed at PAC/edge Festival. There's a riot going on and a radio tower is knocked over trapping people inside of a bus station. 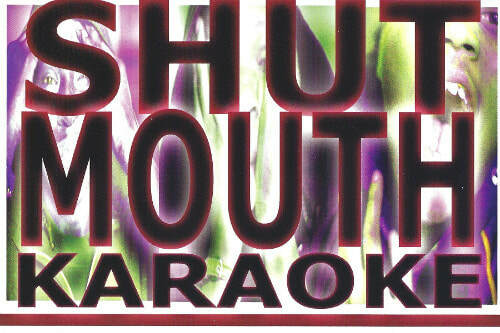 As humanity crumbles outside, inside a group of strangers debate faith, the future, and sing karaoke. Remixing and blending lyrics from Elliot Smith to 50 cent to Cole Porter to TLC. 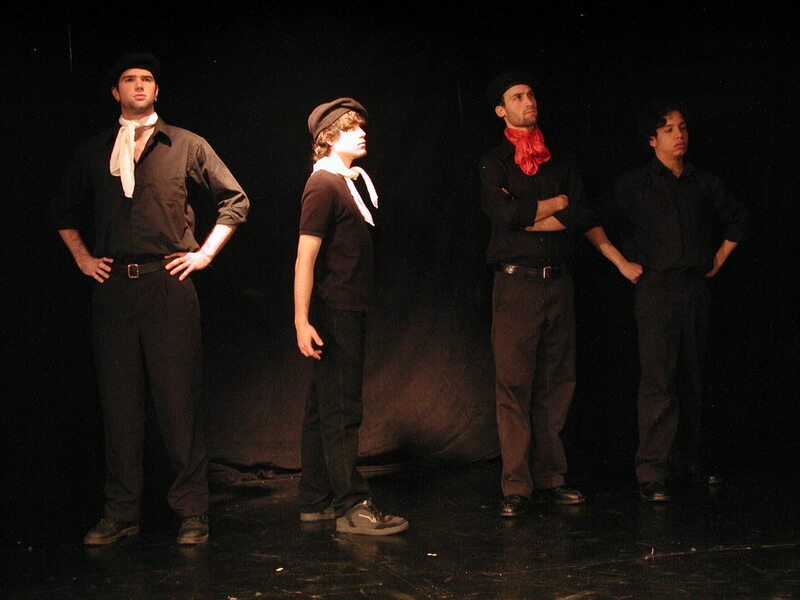 This ensemble-created music-theater piece employs personal histories, poems, and songs from the archive of the Abraham Lincoln Brigade, a group of American antifascists who fought in the Spanish civil war. 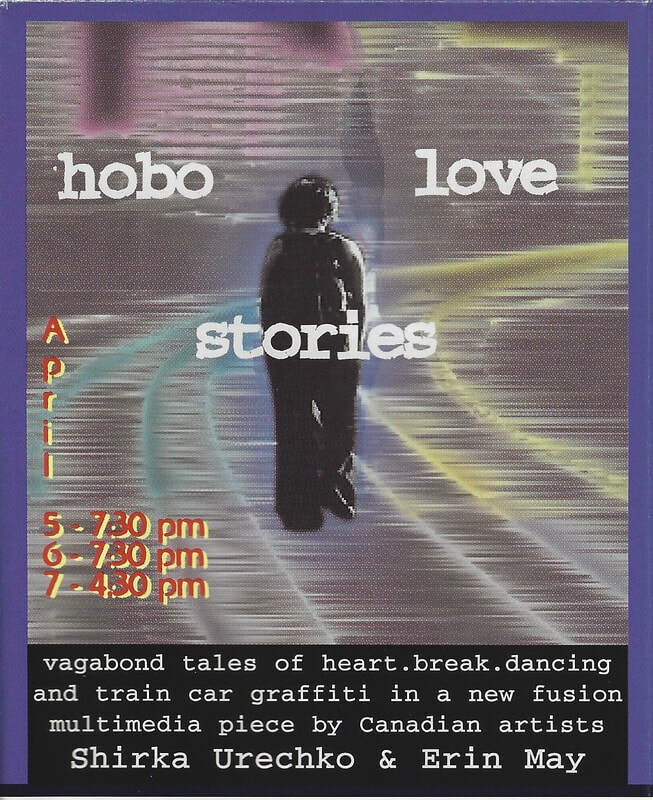 The production, directed by Jenny Magnus with music direction by Jamie O'Reilly, is a collaborative effort of Free Street Programs, the Music Theater Workshop, and the Columbia College Chicago Theater Department. BLAM: What does your heart hear, Poet? What songs unfurl? 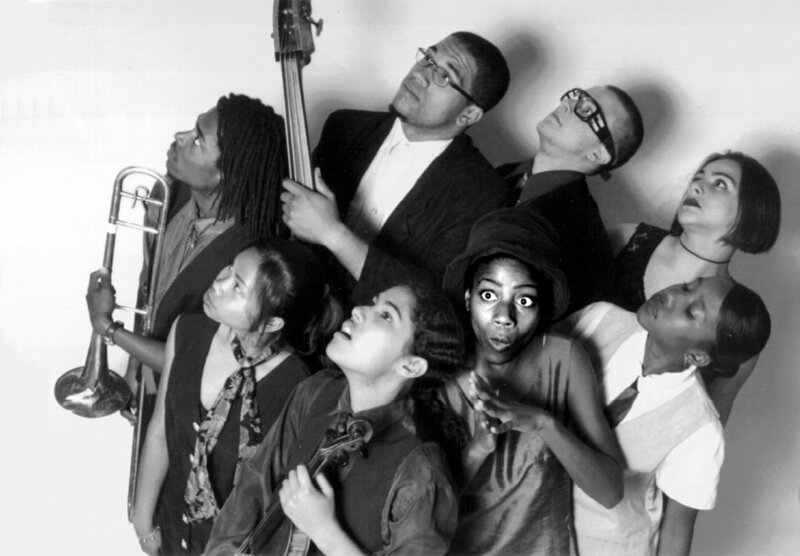 Ensemble: Helene Achanzar, Angelica Flores, David Harewood, Lakeisha Hill, Sandra Perez, Abram Rabinowitz, Yvonne Soong, Mark Valencia, Dave Watkins. 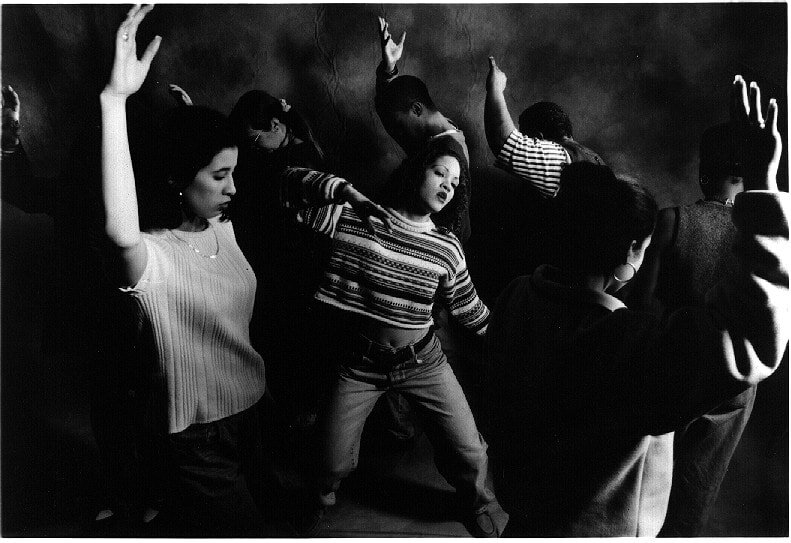 Collaboratively created performance explosion of natural ecstasy induced by Allen Ginsberg's "Howl." 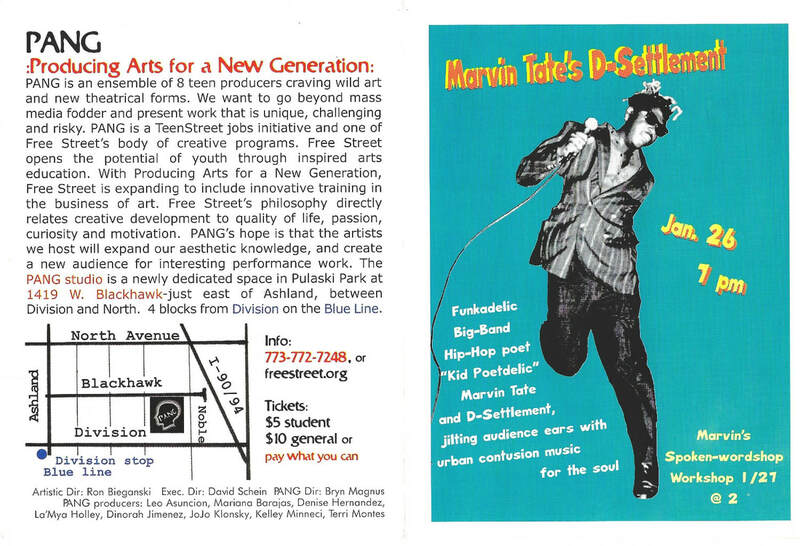 It draws together the aesthetics of Word, Hip Hop, Jazz, Beat, Video Images, Performance Art, New Movement. Moloch, I'm with you, Holy. The 'Hero's Journey' in myths from around the globe are smashed into patterns, standards, and images reflected in the lives of contemporary urban youth. 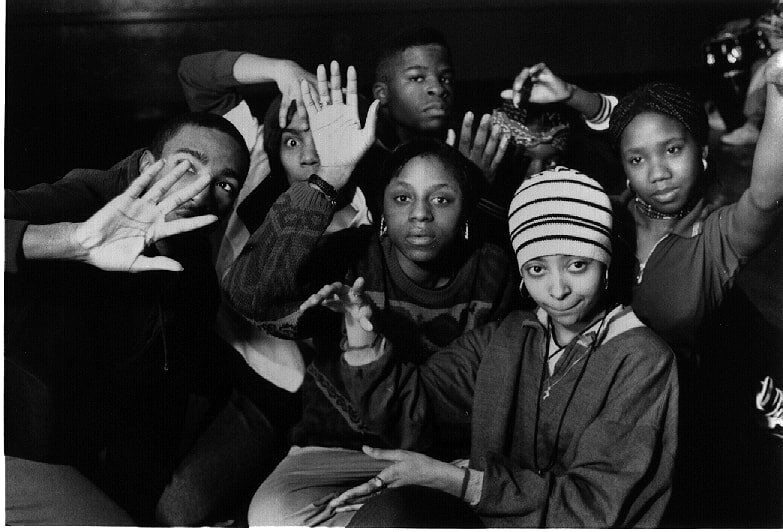 Facilitated by HBO Def Poetry Jam performer, Robert Karimi, the ensemble of emerging artists break down traditional mythologies and create new stories. The conflict between progress and preservation brought to life in the context of the relocation of the historical Maxwell Street market. 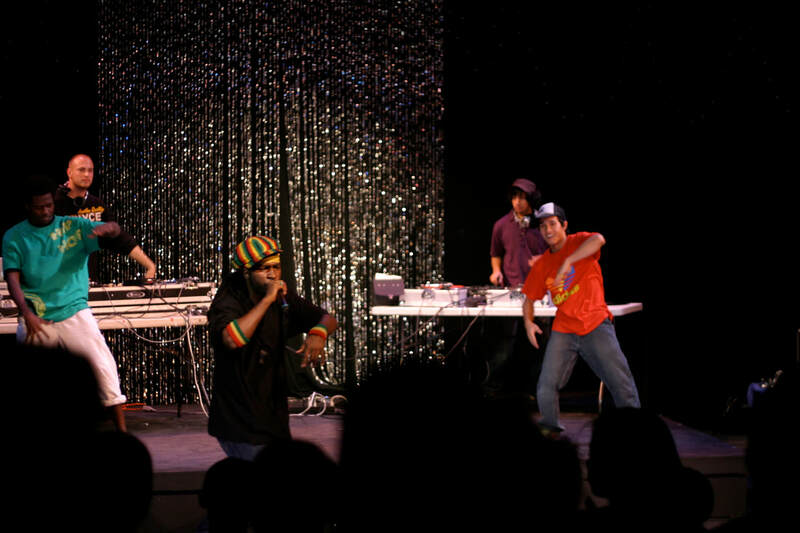 AboveGround is where Chicago's hiphop underground emerges as a new theatrical form. 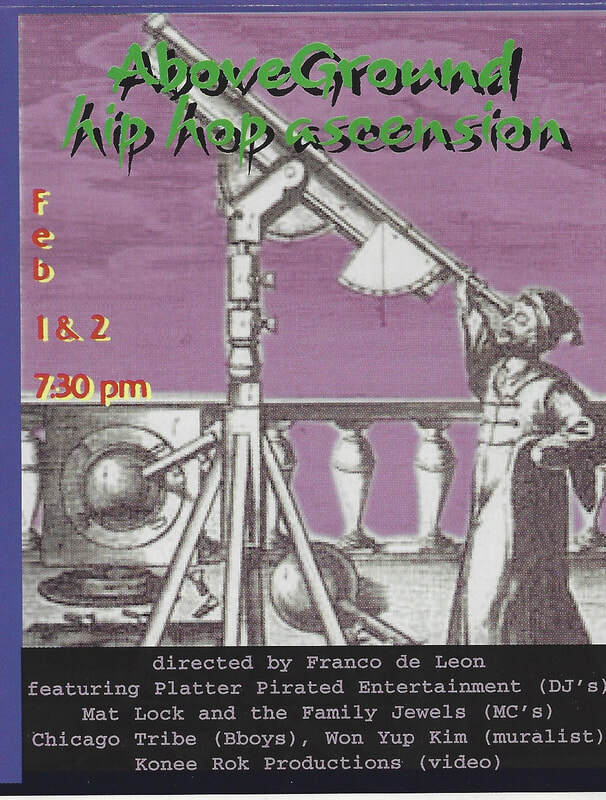 Sound/movement fusionist Franco de Leon turns the DJs, Bboys, MCs, and Graffiti Artists into a single sensory performance of cool opticbeats and hot earheats. 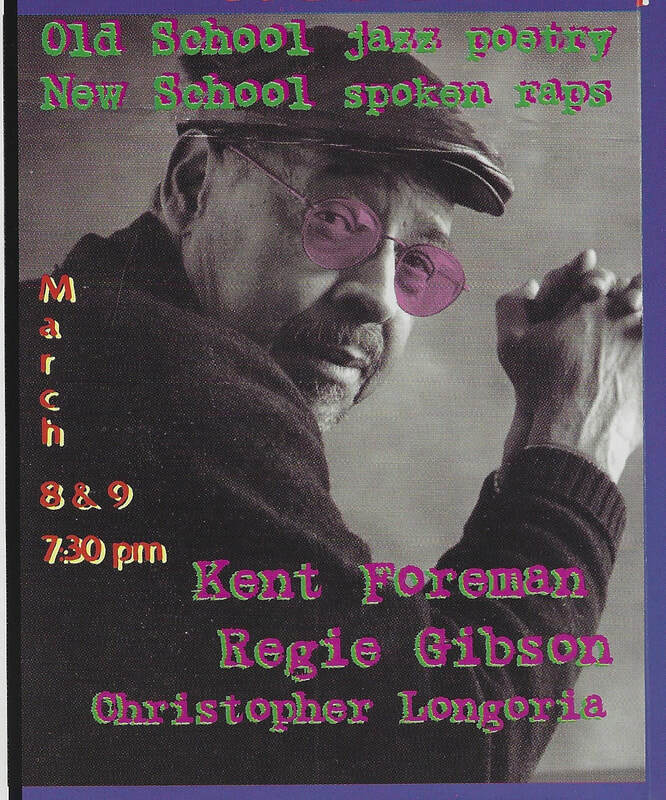 Kent Foreman, Chicago's jazz-poetry elder statesman and Carl Sandburg Award winner presents a repertoire as versatile as the poets and musicians he has collaborated with including Allen Ginsburg, Maya Angelou, Max Roach, and Oscar Brown Jr.
Reggie Gibson's rythmystical style of spoken-word and deft beats won him the '98 National Slam Championship in Austin. Christopher Longoria, San Fransico word griot is currently working on an EP release with Future Primitive Sound Collective DJs Faust and Shortee Romanowski. PANG: "Si La Gente Quiere Comer Carne, Le Damos Carne"
Antonio Sacre's new show "If People Want to Eat Meat, Let Them Eat Meat" is the remarkable story of his tri-athlete/petty criminal brother. Antonio Sacre animates 15 tweaky and hilarious characters who bridge the gaps between the successes and failures of his brother's life. 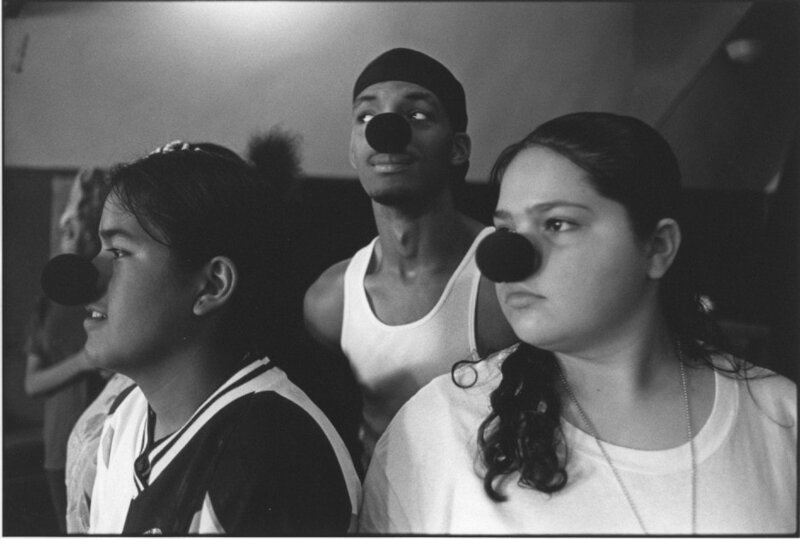 Antonio has performed his true life comedy at the HBO workspace, the Knitting Factory, the New York International Fringe Festival, and the Rhinoceros Festival in Chicago. 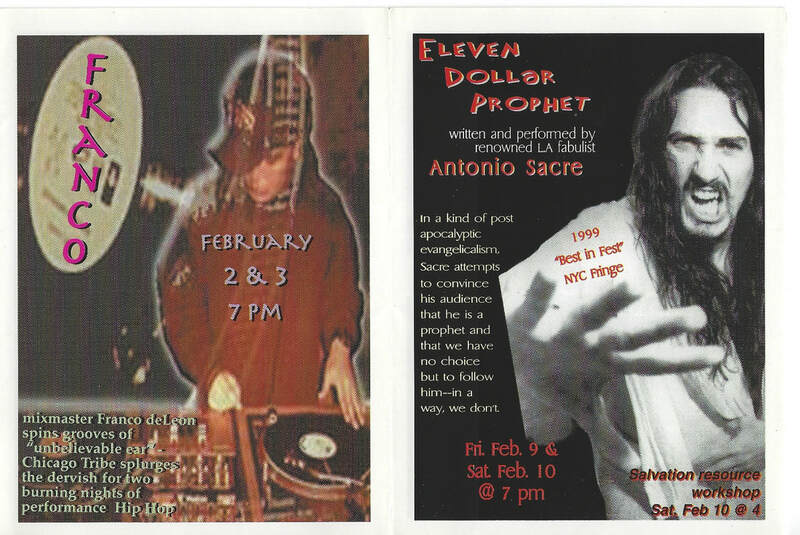 The Village Voice confirms that "Sacre is a serious artist." A fascinating collaboration between three dancers and three musicians investigating extremes of the "quartet." Three minutes to think, three minutes to move. unfortunately this performance was canceled at the last moment as the artists were blocked from traveling to the US from Canada due to travel visa issues. 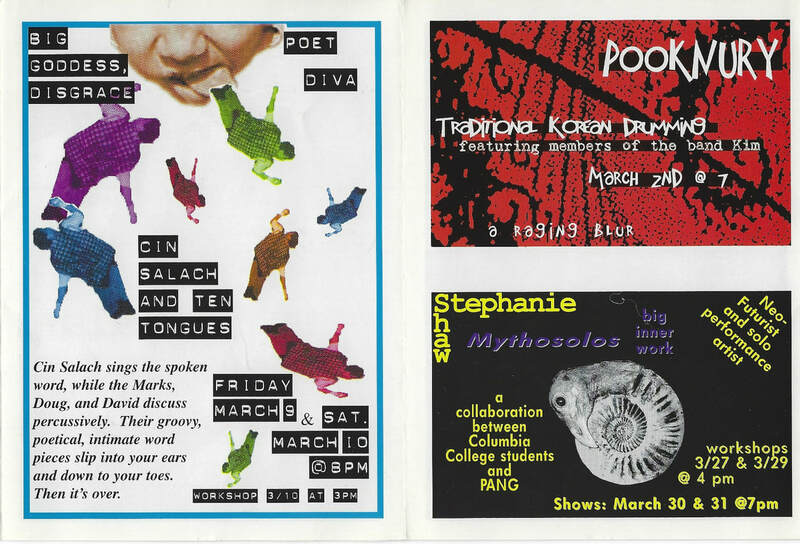 "Storefront theater is where a lot of the most innovative and risk-taking work in writing is happening in Chicago," said Beau O'Reilly, one of the co-coordinators of the festival more commonly known as Rhino Fest." 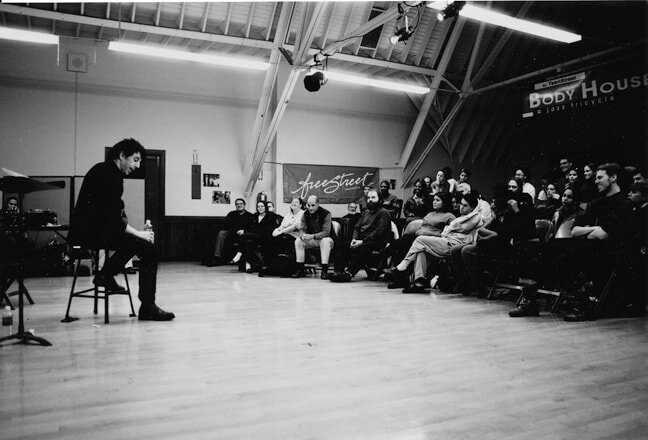 2001 - Eric Bogosian read from his new book Mall at a special PANG event after being invited by PANG teen producer Leo Asuncion. Ensemble member Robert Rodriguez opened the event by performing a monologue from Bogosian's play Suburbia. Fun Fact: The baby in this picture grew up to be a NeuroKitchen founder! "The true power of the piece comes from the cast, who unselfishly create one woman's fractured life through startlingly pure moments of joy, humor and rage." Mecca is living her life backward. She begin old and full of memories, as she gets youger she has fewer memories. 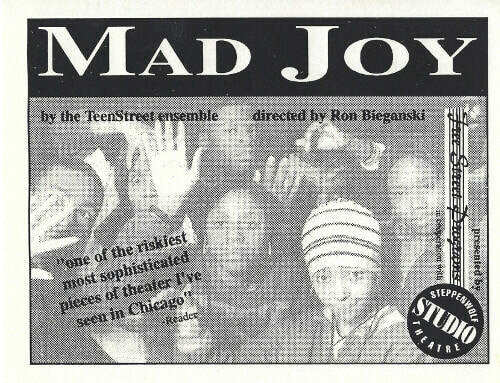 Chicago Reader: "Mad Joy is one of the riskiest, most innovative and sophisticated pieces of original theater I've seen in Chicago in the last three years." 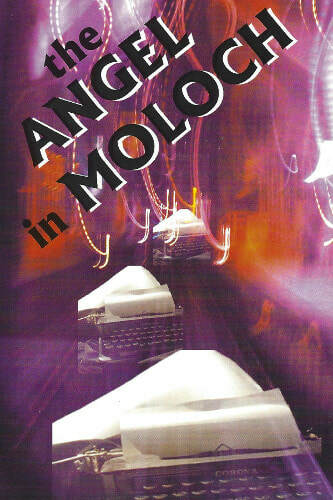 Chicago Sun-Times:" Take the absurd spirit of Eastern European literature from Kafka to Kundera. Spin it together with the funky, sometimes dissonant marching music of a New Orleans funeral. 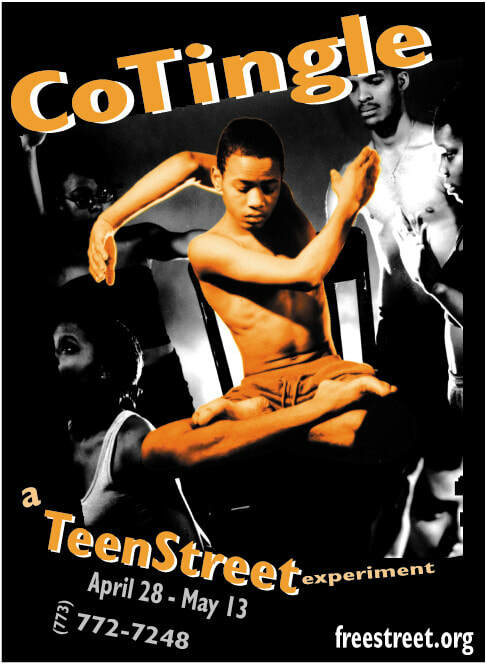 And you many just get a hint of what awaits you in TeenStreet's haunting, hugely imaginative production, "Mad Joy," now in a brief engagement at the Steppenwolf Studio Theatre,"
Chicago Tribune: "Mad Joy," however, goes beyond the semidocumentary to become an almost avant-garde work of art-house sophistication." "I keep thinking about that boy that fell from the window. I think about the dangling part a lot." places they might not have even dreamed about. "People go to the level you ask them to. I only ask that they go to the level of their highest intelligence," he says." Chicago Reader: "What makes this production so engaging is its complex, sophisticated treatment of these issues: it daringly interweaves cathartic dance numbers, eerie songs, and intensely personal stream-of-consciousness monologues." "what can be more dangerous than death?" "Heaven is a place where I can walk freely. A place where I can stand out in this drive-by world without being touched"